Videos are a great way to keep your visitors interested and active on your site. They are fully integrated into eDirectory - just give us the link and we'll simply do the rest on your pages. Whether you are doing product reviews or vacation rentals, video is an important component of modern directories, and we have you covered. 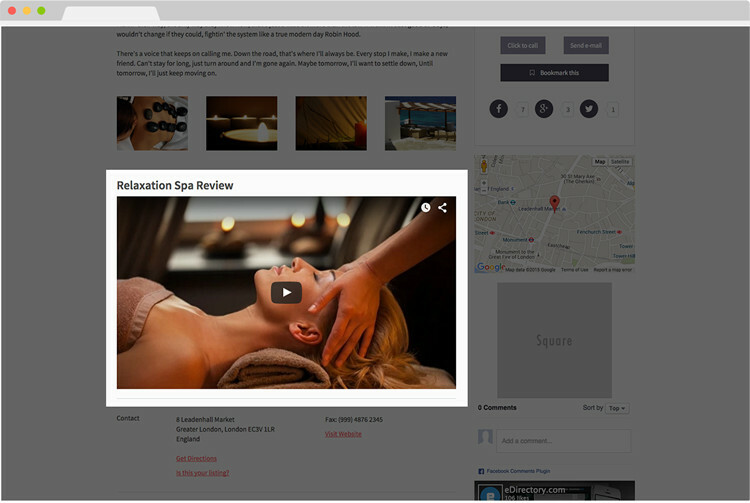 The video player is displayed inline with the listing information, giving a clean view for the visitors. A full screen view is also available. Adding a video to a listing is as simple as dropping an embed code on the listing form, and it's live. 3-2-1 Action! Video can be hosted on Youtube, the private label Vimeo, or even your own video service.